My mage is lvl 61 and has the necklace and the aug from handing in the bosses head of takish equiped. I get he normal you opened text then the intar planar error message which dumps me at the drop spot in takish. Looks like you need to reset the arcstone min/max level status. Did yesterday, will check it again let my druid get in though he did port in rather then run,will look into this. Not sure why your experiencing this. Loaded a 60 druid (non GM account) did head turn in and clicked right into arcstone no Issues. When clicking on the portal near the captain elf spawn the screen says you unlocked the zone but the inter planar crap warps me back to the drop spot in tak. 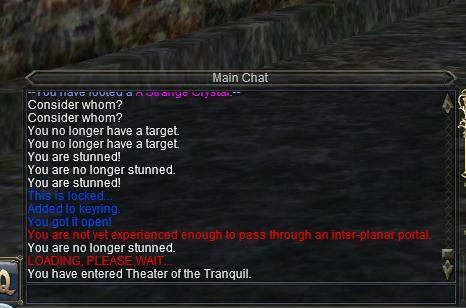 I checked the teleport npc in hub and he lists arcstone as unflagged still even after the key "unlocked" the portal. I was going to try to delete the aug you get but the npc doesnt sell the aug remover type it needs and i cant delete the whole necklace since i dont have the plat to buy a new one since you added a cost to it. And if i turn in a new head for the quest it just says you cant receive a duplicate item, incase the flag got broken when i finished the quest before you added in arcstone. Tried with my zerker also and got same result. check chat box. Ok so its showing only 2 characters flagged for arcstone(both my test players non gm accounts) they did not do flag quest until after arcstone was released. So it seems if you got the aug before the release you need to redo quest. Im testing the theory now by creating a brand new character and gaining arcstone access. If this is indeed the problem I will simply give you a new one as it is not your fault. Ok so I figured out the Problem. It seems for some reason the server wont let you zone to arcstone unless you have been flagged via Vaspian. There is no known reason as to why its happening at this moment but im looking for the bug. zone data confirms the powersource is the zone flag so i have no clue as to why this is happening. Vaspian should be his own flagging system(which he is) will be looking into the issue further. Problem has been fixed. Simply give the Elddar the head again and you will be good from there. You do NOT have you delete your aug. Simply giving the head will reward you the flag. And for now upon having the flag Vaspian will port you without his required item. This will be fixed soon.